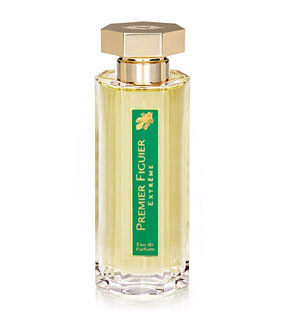 Yesterday, I wore L'Artisan Parfumeur's Premier Figuier Extreme. I picked it in part because the label is green (even though I used a sample, I've coveted the bottle enough that its clean green label was fresh in my mind), but it wasn't quite right. I'm feeling that desperate lean towards spring, weather where I wear a light coat in the vain hope that nature might somehow cooperate with my poor choices. "Ugh. I had hopes but this was too old smelling for me. Depending on what part of the country you live you might not get this, but I think it smells like a split open Monkey Ball with a soft baby powder like aftermath. I'd love to smell this when I hug my Grandma, but on someone my age (24), gross." Monkey ball! 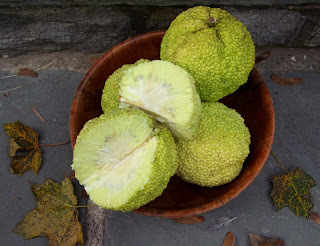 I did not get that, Anonymous, but a little searching led me to the osage orange, which I have never tasted, nor smelled. Add that to the nostril list. p.s. Preets, if you are reading, does the osage orange's skin-texture freak you out?? That things freaks me out, that's for sure. I like how she used "aftermath" to mean "drydown." Makes the perfume seem like a true disaster. Elisa, does this mean you are also freaked out by the seeds in a green pepper? Or is it there something other than the texture that unnerves you about the monkey ball, aka osage orange, aka horse apple, aka bodark (this fruit has good names, I will give it that)? There's an osage orange tree near my parents' house here in Salt Lake and the monkey balls always seem to fall around Thanksgiving. I've been using them as part of our holiday centerpiece for years now. These freshly fallen osage oranges smell like Cetaphil face wash, which always (grossly) reminds me of, ahem, a bodily fluid, which I, as a lady, do not make (perhaps the moniker). They also smell like cement, but I think is more a fact of the wet gutters from which I pull what I then turn into decoration. So, yea, not an ideal perfume ingredient. Oh, that's THAT tree, B?!?!? I've ALWAYS wondered what tree makes that smell! But I've smelled those trees in A2 -- do they grow there too? Or are there multiple trees that smell like manly secretions? Nosy girl, those monkey balls *totally* freak me out. Grrrrehewwwwww. Excuse me while I go and scratch under my clothing for 15 minutes. I think I would prefer real monkey balls. No, I *know* I would. They DO grow in Ann Arbor, and you can put them on strings and hang them inside your closet (osage oranges, that is) to keep moths and spiders out of your clothes. I have never done this, but I had a LONG conversation about it once with someone selling them at the Farmer's Market.